Bunions are a deformity of the bones in your big toe. The big toe points in the direction of the other toes on the same foot, this may cause the bone (the first metatarsal) to stick outwards causing a bump which can become sore. 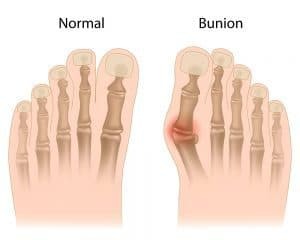 If you think you are suffering from Bunions then give us a call on 01386576128 or get in touch via our contact page to arrange an assessment to see how we can help you.